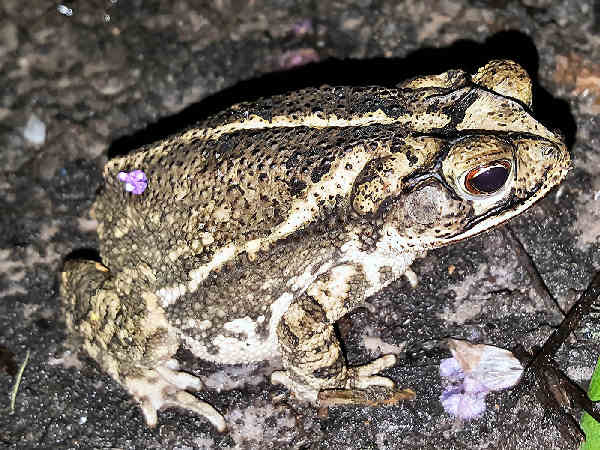 Here’s a story on toad identification. Any toad representative species usually does not get much good publicity. Maybe a bit of toad public relations is in order to reverse all the bad publicity they receive. Here’s one. People continue to characterize toads as the amphibians with warty or bumpy skin, amplifying those physical characteristics with a myth that people get warts by touching toads. It’s not true. 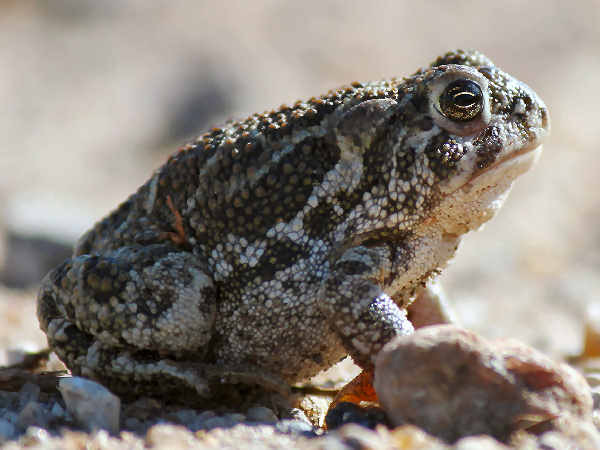 Toad glandular secretions and skin extractions contain numerous natural agents which may provide unique resources for novel drug development. Especially the skin-parotoid gland secretions of toads from genus Bufo contain as many as 86 different types of active compounds, each with the potential of becoming a potent drug. There might come a day when the first thing people think when they think toad is thanks for helping to save lives. With that introduction, it’s onto more toad identification. Nineteen species of toads are documented in the United States, broadly distributed in all areas. Because of their regional distribution, toad identification begins by knowing the toad species in any particular state or area. Habitat also serves as an initial toad identification clue. Usually we learn at an early age that toads live on land and frogs live in the water. That’s partially true. Toads can swim and they live near water environments because they are their natural breeding grounds, just like frogs. 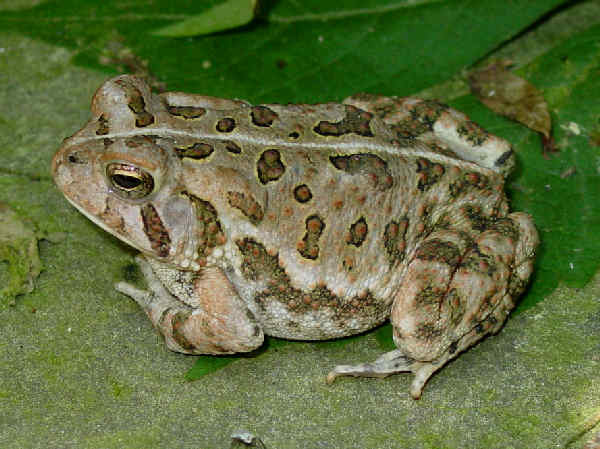 Toads, however, have evolved to be able to adapt to living in the drier areas around ponds, rivers and wetlands areas. 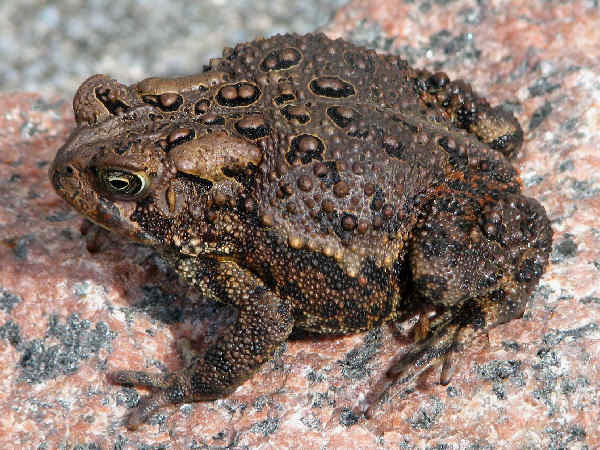 American toads generally have a dull color body that ranges from brown to gray to green to red, and the body color is often correlated with the soil color or natural environment. Many also have spots on the body and a stripe down the middle of the back. Generally speaking then, seeing an amphibian with bumpy skin and stripe on the back, in one of the drier areas surrounding a pond, river or wetlands indicates that the amphibian is a toad. Consider the picture at the top of the page. It’s the American Toad (Anaxyrus americanus). When people think of a toad representative species they often think this toad. It’s a small species that inhabits many areas bordering the Mississippi River to the East Coast. It’s everything you’d expect in a toad including the dull color, warty skin with a stripe on the back. They are common in many back yards with a nearby water source. Taking the general toad identification guidelines into consideration produces some immediate problems. First, if all toads have bodies that can change color depending on the environment, how is it possible to tell one toad species from another in areas with more than one species? For example, the next picture shows a Fowler’s Toad. 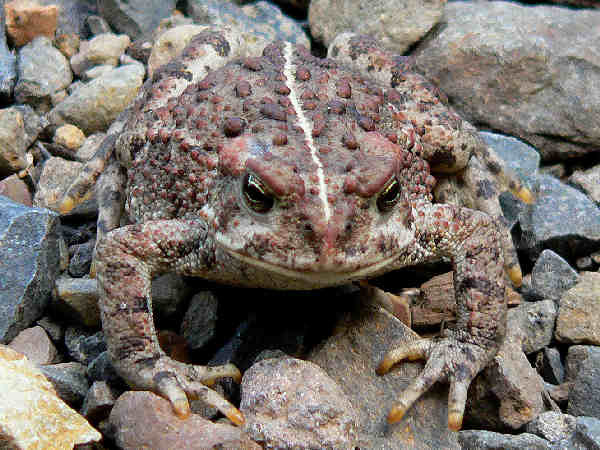 Like the American Toad it grows to about two to three inches in length, has dry, warty skin and a stripe on the back. 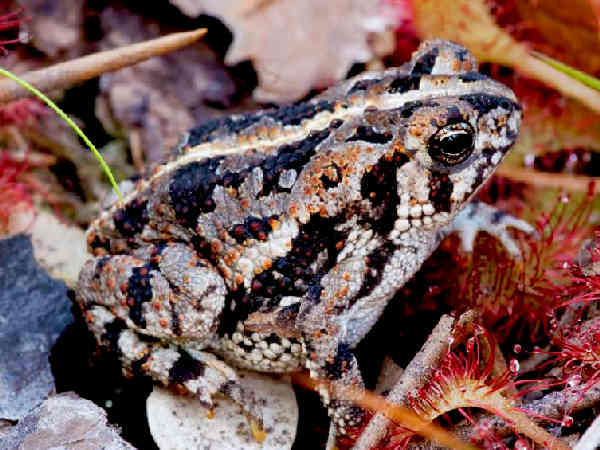 Fowlers Toads are also found throughout much of the eastern US, often in forests with nearby water sources. The only physical difference might be, as highlighted in the picture, the presence of more warts within the dark spots on the back. The only environmental difference is habitat. So, it’s usually a good identification guess for Fowler’s in the forest and American toad in the back yard. The identification emphasis is on good, not perfect. Size also helps with toad identification. Oak toads win the prize of smallest toads, growing no more than an inch and one-half. Oak toads, unlike most toad species, are usually active during the day. They can be found in southern pine forests by turning over logs and other woodland debris. Like the Fowler’s and American toad, they grow to about three inches in length. The skin is usually brown and the chest is spotted. Fowler’s usually don’t have a coastal presence and Southern Toads do, so in coastal areas along the Atlantic and Gulf of Mexico, it’s always a good guess to start with a Southern Toad identification. 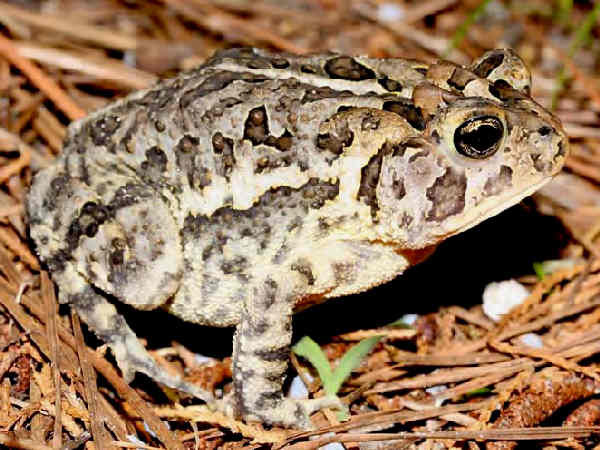 When it comes to size as an identification tool, The Gulf Coast Toad stands as the easiest of the Southeast toads to identify. It grows up to five inches in length. Of course seeing a smaller individual might be a bit confusing for identification purposes. They belong to a different genera of toads, Central American Toads (Incilius). The best field ID clue is the presence of crests and depressions on the top of the head. Size also helps with toad identification as one moves from Eastern to Midwestern species. Consider the Great Plains toad. It grow to a bit over four and one-half inches in length. The picture also shows a toad with dark splotches on the skin. In areas where it overlaps with American Toad territory, it’s fairly easy to distinguish between the species. Moving to the Rocky Mountains and the West Coast, thiksize again. The Western or Boreal Toad can grow up to five inches, ranking them as one of the largest of the native toads. Of course the non-native Cane toads can grow up to eight inches, making them the largest toads in the United States.